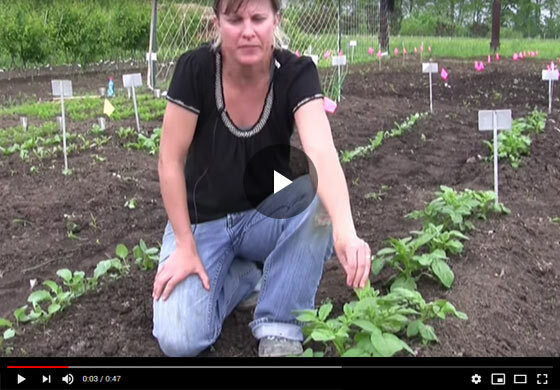 Join Sarah as she demonstrates how to plant and care for potatoes in your garden. Find out how to sow and spread them out in the garden and how to care for them round the year. Hi, I'm Sarah with Gurney's and today we're looking at potatoes. These were planted a couple weeks ago. Just a brief description on planting...if you want to get more potatoes, you want to cut your potato stacks, just make sure you have one eye on each cutting and you can plant your pieces. You want to let them dry out for two to three days before planting after you cut them. And you want to plant them pretty deep, about four to five inches, and it's best to hill your potatoes out, so we came out and made these big high rows and then dug the holes to plant the potatoes and as the plants grow, you want to keep 'hilling up' the soil around your potatoes because if your potato roots start to show, the potatoes will get green from the sun, they'll get sunburn on them and they won't taste good. So you want to keep coming out throughout the year and making sure you keep those hilled up.